I sat down to write this blog entry. 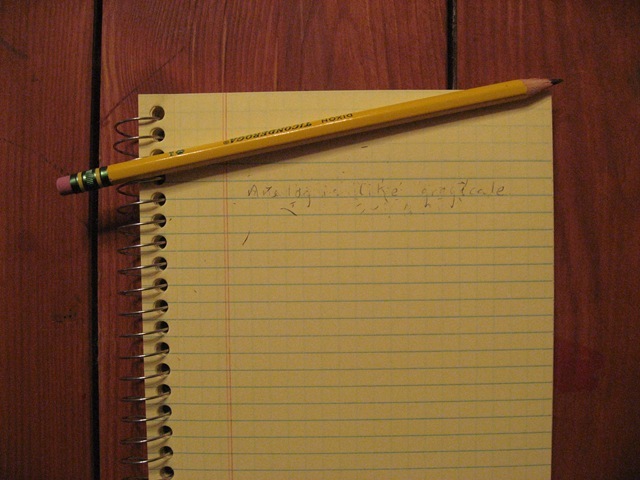 Just me and my Dixon Ticonderoga #2. First thing I wrote was “Analog is like grayscale.” I immediately erased it. Even the word “grayscale” is too technical for what I want to explain. Remember Scantron? 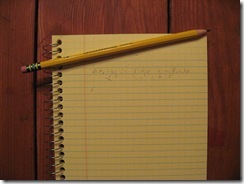 You used to have to bring a #2 pencil to take the test. You’d fill in bubbles A, B, C, D (or E: none of the above) to designate your answer. Why #2? Because anything lighter might not register as a filled-in bubble. Anything darker might still register—even after you’ve erased it. Know what that process is called? Of taking various shades of graphite and making an all-or-nothing decision on them? It’s called Digitization. There’s no doubt about it: the world is analog. Shades of gray occur all the time. So, why don’t computers operate on shades of gray? It takes longer to resolve and it’s not as repeatable. Computers (& all digital electronics) are based on a philosophy of doing extremely simple things very fast, very reliably. Our brains, on the other hand, are built to allow for very complex connections that take time to resolve. And may resolve differently each time. Why? (The Scantron operations, not the smart people born on Tuesday) Because these operations can be broken down into simple manipulations of 1’s and 0’s. You either got the question right or you didn’t. There’s no partial credit. Even if you filled in A 25% and D 75%, it makes a hard decision and picks one for you. The building blocks of digital electronics are made to go fast and get the same answer every time. They’re also very small. I mean tiny. I mean that the width of my hair can handle a heck of a lot of these building blocks. So, when I put them all together, I end up with something that’s way more complicated. And powerful. So, in the past, you might have had to answer 10 questions on a test. It might be a word problem. It might ask you about trains headed for each other. You might get partial credit if you wrote down the right equation but solved it wrong. With Scantron, you don’t just get 10 problems. You get like 100. Since the computer can’t give you partial credit, it just asks you a lot of questions. If you know you’re stuff, you’ll likely get more of them right. It’ll be a pretty good approximation to getting partial credit. So, the philosophy with digital electronics is to do many, many small crude 1 or 0 measurements, rather than a few precise measurements. Each individual measurement isn’t as important. What’s important is that we can store and process these measurements quickly reliably.